Yeah your thinking like me. The way the draft is shaping I don't see Cleveland even drafting Barkley anymore. I can see him landing here. The biggest hurdle is going to be the Gmen at 2. Me neither. But it's got nothing to do w/ Barkley and everything to do w/ Chubb and his positional value as a premium EDGE player. Those guys are just way more valuable to a team than ANY RB. Football is a team sport, but imo if I have a good QB and good DL that can win 1v1s to create consistent pressure it makes the rest of the roster much easier to fill out and build a perennial playoff contender. It's also not a good EDGE class and Chubb is clearly the top guy when it comes to 4-3 defenses. Davenport may develop into a stud, but he's 2-3 years away imo. Landry might be the best pure EDGE rusher, but ideally suited for a 3-4 team imo. Chubb is #1 on my board and if he's there at 7 the only way I'm not taking him is if I'm blown away by a trade offer. I doubt it's an issue, because I cant see the browns taking Minkah over Nelson, Chubb or Barkley. Chubb in particular would do a lot more for that defense than Fitz would. He would be the great all around DE fo put on the left with Garrett on the RE. Stranger things have happened I suppose. Dead at passing on Chubb for Barkley. terrytate wrote: I doubt it's an issue, because I cant see the browns taking Minkah over Nelson, Chubb or Barkley. Chubb in particular would do a lot more for that defense than Fitz would. He would be the great all around DE fo put on the left with Garrett on the RE. Stranger things have happened I suppose. I can see the Browns trading out, but if they stay the absence of Joe Thomas should factor in that pick. It depends on what a team sees in Fitz. 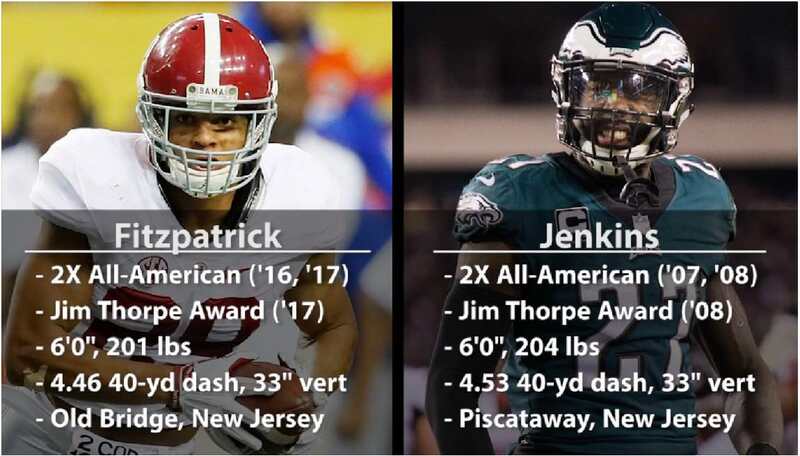 I've heard "talking heads" say that some pro scouts she him as a rich mans Malcom Jenkins, who can do everything well on a defense and play every DB position. I've heard others say hes exceptional at both safety position and could play NB, but probably isnt' a boundary corner. If a team believes the first to be true, he's a top 5 player, especially in the modern NFL. If the second is true, he's a top 15, possibly top 10 player. None of us really know what teams think of these players. I wouldn't be shocked if Fitz is the first DB selected...I also wouldn't be shocked if he's the 3rd selected. I think he's much much better than James, even for us, but that's just my opinion. I agree with the Jenkins comparisons. The similarities are striking. Last edited by mdb1958 on Tue Apr 03, 2018 4:21 pm, edited 1 time in total. In my mock i was going to make that the pick. But in my gut the Bills trade into that spot if Cleveland goes QB at 1. Cleveland would gain 2 first rounders and have the QB of the future. I still think it's a stretch. I have yet to see one person claim that Fitz is a better prospect in any way then Chubb. A beastly pass rusher is more valuable than a beastly corner....and that's assuming you view Fitz as a corner, which I personally don't. Even though I disagree with it, I could see One Buc taking Barkley over Chubb. Barkley is considered to be at least as good of a Prospect as Chubb, and we have a black hole of talent at RB. They could look at the film of Dalvin Cook and Alvin Kamara and believe this guy will have more of an impact than either of them. With both lines reinforced, they likely think we can win now and that's the best time to draft a fresh RB, when everything else is in place. uscbucsfan wrote: It depends on what a team sees in Fitz. Some don't think Chubb is a "beastly pass rusher". Some just think this is a bad class and he's the best of a bad bunch. My point is, you don't know what teams think. Barkley, Nelson, and probably Fitz are more rare/better prospects than Chubb (IMO anyway). Chubb just so happens to be at an extremely coveted position in a draft that doesn't have great talent at DE. It's the same with QBs. It's why we have Ponder, Manuel, etc. going in the first round. Very realistic. I like it. I love this time of year when people instantly dismiss **** they don't like as impossible, yet the draft comes and goes and all sorts of "impossible" things happen, and all kinds of players they thought wouldn't be taken before or after other players are. Happens every year. Yet somehow, in March, people are so sure there's just "no way" something happens. No arguing with the bolded part. I am just calling it as I see it. Plus, we ARE talking about the Browns. Chubb may not quite the same prospect Clowney was, but he's still a hell of a prospect. He's got plenty of size, athleticism and tape. The only flaw I saw was that he plays a bit too tall. He would be a top pick in near any draft and would he the best DE in a lot of them. Doctor wrote: Very realistic. I like it. Can I dismiss Donovan Smith for pick 4 as impossible? You might get a bite for the third rounder.